Over the past month we’ve had two young boys visiting us. Corbin is 18 months and Caleb is 12 years old. Corbin was here with his mom and her guide dog DeeDee, while Caleb stayed on his own with us. During Corbin’s visit we learned that our dogs and cats have a huge amount of patience. Laya and Cessna tended to stay out of Corbin’s way, but the others were patient with his poking and pulling. I wasn’t sure what Logan would do around a young child, but there were times when we weren’t able to catch Corbin in time, so Logan would let out a low growl to let us know she needed our help. Corbin thought Logan was so cool, he liked pulling on her tail and grabbing her ears. Logan never once scratched him, she would just try and get away or call out for help. She isn’t one to hide either, unlike Laya, Logan was out in the open pretty much all the time – guess she thought he’d get the point after a while like the puppies usually do. Phoenix and Aspen weren’t as into Corbin’s poking and pulling, but would patiently lie under him while he bounced until we caught him or he got bored. Corbin has a dog of his own, his mom’s guide dog, but he still doesn’t really know how to properly treat animals. He’s still young though, so hopefully he’ll learn soon. Canyon was the best with him. He never once shyed away and was always willing to let him pull on his tail, ears and jowls. At one point corbin even had a hold of Canyon’s lips while sticking his thumbs into his nose. Huib caught him in the act and that was discouraged. Even though Canyon didn’t always like what Corbin was doing, he still went up and wanted to play. It’s amazing to see how well cats and dogs can behave around young children – even when they aren’t used to having them around. Caleb was much better with the animals. He offered to feed the cats each morning and let the dogs out for relief. The dogs loved having him around, but he wasn’t a huge fan of their desire to lick him or be in his face. His favourites were Cessna and Aspen, he’d ask to take them out with him all the time. Canyon was a little much at times for him, but I had to remind him that his energy level wasn’t always helping either. Caleb didn’t realize why Canyon wanted to always jump up on him when he was dancing around or laughing uncontrollably. Caleb liked taking Cessna with us to the gold mine tour in Timmins and Science North in Sudbury. Caleb and his mom fostered a puppy named Jasper for Autism Dog Services so he was used to taking dogs places, but he still seemed to like seeing how Cessna reacted to the different environments. At the gold mine tour the tour guide showed us how the different machinery worked which freaked Cessna right out. The slusher and drill are extremely loud and with us being underground the rock vibrated and the noise was amplified. She was a trooper though and calmed right down once the machines were turned off. At Science North I thought she’d be afraid of the noises coming from the dinosaurs and the ones that moved, but she surprised me and didn’t even react once. I think she really liked the insects and animals she got to see. Caleb was able to hold almost all of the insects in the exhibit and made sure to show Cessna, she thought that was pretty cool – I made sure she had her gentle leader on though so I could easily control her excitement. When we were on the animal floor, she was totally enthralled by the skunk who was anxious and walking back and forth in its enclosure. We didn’t take her with us on the second day, but I actually got to touch the skunk – she (Rosie) felt a lot like Cessna, but with fur about the length of Canyon or Laya. Canyon came with us to Sudbury and Toronto, he was awesome! He settled immediately in his crate while we left him at the hotel – huib looked under the door to see what he what he was doing. At Caleb’s house in Toronto he was interested in the bird and snake, but was easier to re-direct than Cessna who wouldn’t stop going up to the bird cage. On Saturday night I went onto Facebook to see what was new with my friends and family and saw that my friend’s daughter was back in the hospital. Knowing that we were only a few blocks away, I decided that we’d go visit with her before heading back north. Christina has a service dog from Autism Dog Services named Spencer so loves seeing us with the dogs when we visit. The second we entered her room she had a huge smile on her face and throughout our visit never fell asleep or stopped giggling. The funniest part of our visit with her, was to see how she pretended to sleep every time a doctor or nurse entered the room. When you first meet Christina you’d think she was unaware of her surroundings and it didn’t matter what you said around her – well you’d be completely wrong. She is unable to communicate, but from watching her facial expressions and observing her reactions to various incidents you actually understand that she’s quite an intelligent little girl who can’t express herself, but knows how to work the system  Christina’s seizures still seemed to be under control while we were visiting so the doctors were talking about sending her home the following day, so that was pretty exciting news. Our trip home was pretty uneventful and boring for the dogs, but they were good little travelers as usual. It’s hard to believe, but as of Tuesday we’ve lived in Northeastern Ontario for a year. So far it hasn’t been all that great, but hopefully this year will bring a little more luck and less frustration. Huib has 3 more years left of his contract with the Kirkland & District Hospital, so hopefully the time will go quickly or things will improve dramatically. Just before I finished my degree at Guelph I began studying for the LSAT and applied to potential law schools. I went into the test not knowing how I would do, but left knowing for sure I had failed – my proctor was diabetic and had a low blood episode so incorrectly filled in my score sheet. I decided to take a year off and figure out where to go next and decided on social work. I got my acceptance letter to McMaster University just before I went to Dog Guides for Cessna – I was so excited!! I got amazing marks throughout my time at Mac and just before the whole placement experience happened I thought, “for sure, social work must be the field for me.” – was I ever wrong!! It took the field placement person over two months to find me my first placement, she talked to over 20 different agencies and each were eager to have me until they learned about my disability… When she finally found an agency willing to take me on the other students had already been working for 2 weeks. My first placement wasn’t the greatest, but I met some interesting people and improve my advocating skills. My second placement was much better, but still I ran into issues – my supervisor was constantly asking me “so, once you’re in the field, how will you do this?” rather than helping me to look for solutions. Don’t get me wrong, she taught me tons and I really enjoyed my time with her, but she also showed me how narrow-minded social workers can be. In addition to all the placement issues I experienced, I was continually running into problems with my fellow students. Not one of my classmates had a visible disability and not one of the instructors looked at issues faced by people with disabilities – they all focused on women, children, poverty and racism. I would constantly raise my hand in class and ask why we were only being taught about these groups and no matter what, I was always brushed aside or made to feel like an outcast for my questions. In my opinion, social work is based on the belief that people are broken and need to be fixed. I don’t know why we weren’t being taught more about how to work within the systems that hold back society and to help clients achieve their life dreams. If social workers did more of this, rather than just providing bandaid solutions, I think the field would be obsolete and there would be less psychiatric conditions. Since graduating from Mac in June of 2007 I have applied for several jobs and attempted to attain a masters degree without success. Most social work jobs require a person to either have a driver’s license or masters degree, neither of which I have. All of the job interviews I’ve attended ended in me being told the agency would have loved to hire me, but I just don’t have the experience required – I have tons of volunteer work though… I get the same response from masters programs, you just don’t have the work experience we require for admission – so what now? It’s an endless cycle and no matter what, I can’t seem to get past it! Today I called the Association of Social Workers to ask for their assistance. Guess what? I was told, you aren’t a member, you need to pay $106 and you’ll have access to our social work job bank. Okay, now let me get this straight…. I pay $270 to one organization and get nothing in return, then I have to pay $106 to another organization in order to get access to a job bank and nothing else???? I’m at a loss for words, I don’t know where to go from here. I’ve done everything I was told, I was a good girl and successfully completed 2 degrees at 2 different universities and for what? To live on a government pension? To rely on my husband for everything from toothpaste to a place to live? How does this even close to make sense? Some of my friend’s have been doing something similar on their own blogs, but instead of talking about me, I thought it might be interesting to post my favourite canine memories. Since I always seem to focus more on my other four-legged family members I thought it might be cool to begin this segment of my blog with a memory I have of Aspen. We got Aspen when she was 7 weeks old. 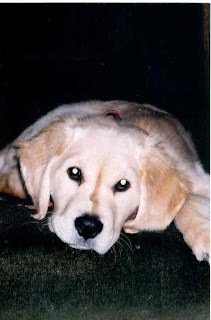 She was an adoreable little golden girl – looking more like a lab than a golden back then. We picked her up on a Friday and brought her directly home. Phoenix wasn’t much into getting to know her at first, but once we got her home and he saw that she was staying, he was eager to get her playing. He would run and she would be hot on his heels, but then he’d turn and begin to chase her which was fine until she would stop and sit… Phoenix wouldn’t be able to stop as easily, so would plough over her, sending her yelping and crying to us. He never actually hurt her, but from her cries you’d think she was dying. On the Sunday after we picked her up Phoenix and I went to camp. My aunt came along for the drive and promised to help Huib with our new little golden bundle. She carried Aspen all over the camp while Huib helped Phoenix and I with our luggage. Once we were all unpacked, Phoenix and I walked Huib and Auntie back to the car. Aspen was in Auntie’s arms and loving all the attention as they walked down some steep stairs. As they neared the bottom though, Auntie tripped. As she fell she worried about little Aspen so made sure to have her roll from her arms as they went down. Aspen rolled a couple feet away from where Auntie dropped and wouldn’t move even a whisker… She laid there for over 3 minutes while we panicked. My Aunt was so worried that she had injured our little puppy, but all of a sudden Aspen jumped up and began running around our feet, so proud of herself.